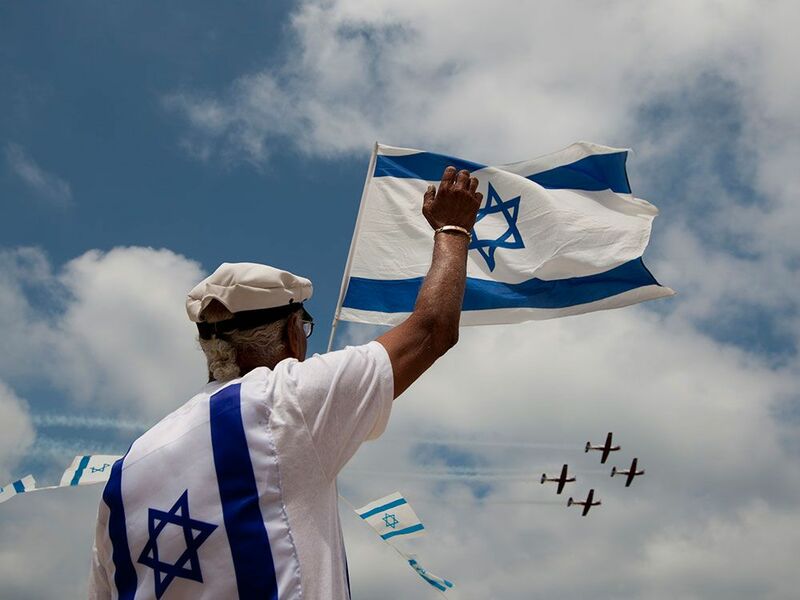 An Israeli waves toward an air force flyover during Israel's 64th Independence Day anniversary celebrations in Tel Aviv in a file photo from 2012. Until now, the U.S., with its many millions of Jews, has been the most Jewish country in the world. For context, in 1948, when Israel achieved official nationhood, only 600,000 of the world’s 11.5 million Jews lived there (5.2 per cent of world Jewry). By 1967, Israel’s Jewish population was 2.4 million (almost 20 per cent), and in 2012, 5.9 million (43 per cent). The exact numbers are disputed according to methodology and definition of Jewishness. Landver puts the Israeli number at 6.6 million, the U.S. figure at 5.7 million, while Pew has the U.S. number at 7.7 million Jews identifying as Jewish at some level, which includes 2.4 million people with “Jewish background,” but no affiliation or practice. It’s good in the sense that, since Israel is the Jewish homeland with Jews the only extant indigenous people who consider it sacred space, this is a return to an original norm. However one calculates who is or is not Jewish for census purposes, everyone agrees the trend is to a diminishing Jewish presence in America (secularization, intermarriage, low birthrate) and an escalating Jewish presence in Israel. So whether it’s this week or next year, the population die are cast, and will, according to Hebrew University’s Sergio DellaPergolo, an expert on Jewish demographics, reflect a demographic reality not experienced by the Jewish people since 586 BCE. In the age-old question: is this good or bad for the Jews? It’s good in the sense that, since Israel is the Jewish homeland with Jews the only extant indigenous people who consider it sacred space, this is a return to an original norm. Twenty years ago, it was estimated that 98 per cent of Jews no longer reside in the place in which at least one grandparent was born. Perhaps it is a few percentage points fewer today. Still, such numbers speak to a rather lachrymose history of dispersion and insecurity, in which the dream of Zion restored has been both a comfort in adversity and motivation for endurance. Once the dream came true (at a cost of two-thirds of European Jews’ deaths, numbers still not made up), it makes sense that Jews should gather in the one place where they know they will be unconditionally welcome. A steady stream of European Jews — notably from France, where the state has proved unequal to the task of quelling or reliably containing Muslim anti-Semitism — will continue to swell the ranks of highly cultured and well-educated Jews who can fairly seamlessly and productively integrate into Israeli society. It’s bad in the sense that the more clustered Jews are, the more tempting a target they become for neighbourhood bullies bent on eradicating their presence. As Iran’s anti-Semitic overlords frequently note, one nuclear weapon would effectively destroy the Jewish people for good. There would be survivors, but remnant exile yet again is not in our cards. In a secular world, one would not see the persistence of Zionist faith as happened in pre-modern exiles. Demoralization would be complete. Most other small peoples, once defeated and exiled, die out. Israel’s modern rebirth was a miracle. Another of that magnitude seems unlikely. Last year, in the Jerusalem Report , where he is the senior editor, Amotz Asa-El wrote a fascinating five-part series titled, “The Re-invention of Jewish Space,” dedicated to predictions on what those changes will mean for the Jewish future. Most interestingly, he sees a breakdown of relations between Israeli and Diaspora Jews. “Jews’ historic commitment to each other is eroding,” he writes. Jews have always tended to unite under oppression. There is plenty of anti-Semitism in the world today, but not the literal oppression experienced by Soviet, Ethiopian, Moroccan and Syrian Jews, almost all of whom are now ingathered. With no need today for solidarity in support of literal liberation, Jewish bonds have psychologically slackened. Where Diaspora money used to be crucial to Israel, it isn’t any longer. Israel is prosperous. Philanthropy from, and the sale of Israel Bonds to, the Diaspora comes to $4.3 billion a year, but that is less than one per cent of Israel’s GDP. Asa-El predicts that the less dependent Israel is on the Diaspora, the more indifferent and even hostile Israeli Jews may become to us.